Inspired by Christmas markets from around the globe, the Circuit Makati Christmas Bazaar will feature six Christmas villages bursting with over 500 merchants offering the best holiday finds--gift items, clothes, accessories, knick knacks, electronics, toys, and food. For everything from fashion to gadgets to little trinkets ideal for gifting, check out the Millennial Spot, featuring online influencers Dani Barretto, Mikyle Quizon and Mikki Galang from Karl Edwards and Kaizen Events Inc. to give you well-curated items perfect for the holidays. 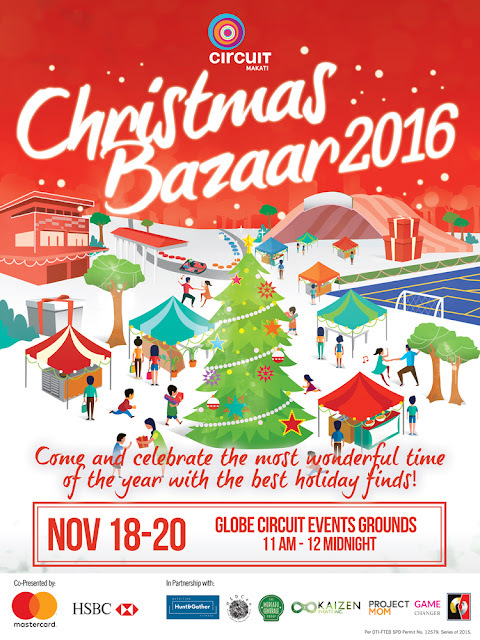 The Circuit Makati Bazaar 2016 is co-presented by MasterCard and HSBC. Raffle prizes, special gifts and more await all MasterCard and HSBC cardholders at this 3-day shopping extravaganza.